For many of us winter brings snow. Depending on where you are, this could last for months, weeks, days or maybe a few hours. The challenges can be very different depending on the length of time it lasts for – and how deep it is. Some dogs can have a wonderful time playing and cavorting in the world of white, while others resent the fact that they have to pop outside for a couple of seconds to do their business. In a lot of ways they are like people – some of us revel in the joy of snow, while others are all too glad to see the back of it. In the UK, we rarely see more than a few inches of snow, so spare a thought for our friends in colder climes. I asked one of my friends in Canada for the sort of issues that the snow caused in the garden with his dogs. His first question really made me think. It was how to stop the dogs lifting their legs on the top of the shrubs? It put the idea of snow into a whole new perspective for me. 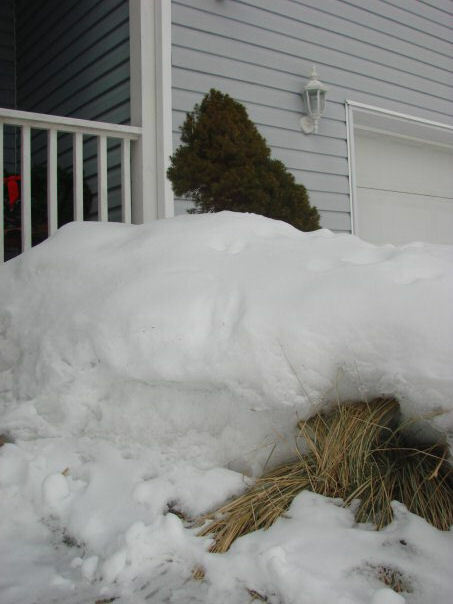 Canadians are well used to lagging all their shrubs in preparation for the winter weather, but the raising of the effective ground level by four or five feet, or more, is something they have to contend with too. Logically, when the dogs’ ground level is higher up plants, they have found a new spot of unmarked territory, so there is a huge inclination to claim the shrub. This issue is further exacerbated by length of time that the snow tends to be around. Slowly the snow level will drop as it becomes compacted and eventually, as spring approaches, melts. This will mean that all levels of the shrub will eventually be subject to the dogs’ attention. My usual solution for this problem of using stones, described in To Grass or Not To Grass, wouldn’t work very well in this situation when the ground level changes over the winter. It seems that my friend’s solution of sometimes putting a burlap fence around plants that are the subject of particular interest is a particularly sensible one as the dogs won’t be able to get close enough to the shrub itself. However, I would be tempted to “super” lag the plants at the beginning of the winter season, and then they will have a better chance of survival as well as having additional protection. His second problem relates to the first. 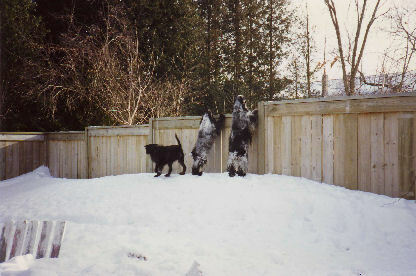 The changing ground levels can mean that fences that were six feet high and ensured that the garden was secure can suddenly become no deterrent at all for any dog when there is four feet or more of snow on the ground. The last thing anyone wants to do is spend ones life in prison behind twelve foot high fences, assuming they are allowed by local laws. If fencing was the UK style of wooden panels, then I would be tempted to add a few feet of trellis to the top as outlined in Fencing. However his fencing, at least in the dog paddock is the more normal US style chain link fencing. If you regularly have this problem for extended periods of time, it might be appropriate to invest in some crowd control barriers or sheep fencing panels, which can be acquire quite reasonably at farm sales, and could be put in place when required and which could cope as the ground level drops. If major snow is forecast, it might be necessary to bring the fence under cover and bring it out again after the snow fall. If you have small dogs which could get through the gaps in this fencing, then covering the panels with wire netting would make them secure. Alternatively, if you have this problem for very short periods of time, then some puppy playpen panels (Puppies and Gardens) can always be used to provide a temporary secure area. Around the edges of the property, deer fencing might be a suitable solution. It is nearly invisible and would have the added benefit of ensuring that no deer can get into the garden, in the summer at least. We all know that ice on Ponds can be very dangerous and have heard of owners going to rescue their pets, but ending up drowning themselves. These situations normally happen in public locations, but remember if you have a pond, then there are dangers for your dog when they are icy. If your dog is known to investigate your pond in normal circumstances, then it would not be unusual for him to want to explore this “new” surface. Keep an eye on your dog in these situations, and depending on the depth of your pond and your ability to “guard” it, you may wish to consider temporary measures to stop your dog getting close to the pond. Another other winter challenge is black ice. One of the problems about living in a relatively temperate climate like the UK is that we rarely experience the extreme snow conditions found in some parts of the world. However hovering around zero also can be extremely dangerous. During the day, the temperature rises and a minor thaw happens, then when the thermometer drops below 0ºC overnight, the moisture freezes and black ice is here. This winter, I suddenly became aware of the major downside of replacing grass with paving. With grass the ground below is frozen, but grass is still safe to walk on, but the paving made a perfect surface for black ice. My garden had become a skating rink. The first inkling I got was when I let the girls out first thing in the morning and I saw them slip. They were better off than humans as they have four legs to balance on, but through out the day I saw them periodically slip. Luckily we only had the black ice for one day here on the south coast of England. If it had lasted any longer, then I might have been tempted to join the queues of people buying salt at the supermarket. The big problem about using salt is that it can damage dogs paws. It is possible to buy boots to protect their feet, but these often get chewed or otherwise damaged. A better solution is to spray on aerosol vegetable oil which protects the feet from salt and reduces the chance of snow balling in their feet. Thankfully, problems with snow lying on the ground are unlikely ever to last for long in my part of the world. I have never heard of using an aerosol vegetable oil. Super idea, especially for those of us living in the Canadian Rockies.